Salt therapy even has a name Thalassotherapy, from the Greek word thalassa meaning "sea". Naturally occurring earth minerals are absolutely critical to maintaining healthy skin! Not only are the minerals found in abundance in sea salts vital inside the body, but most us don't realize that sea salt dissolved in water and applied to the skin surface works to support healthy skin function and a strong skin barrier from the outside. Thassotherapy for the bath, a nourishing tradition! Thalassotherapy for FACES! Formulated for gentle exfoliation AND as a leave on treatment for deep nourishment as you sleep. Many of us are tuned into the health benefits of Epsom Salt and Dead Sea Salts for bringing relief to those with a wide range of skin problems ....Yet ask someone if they know about the amazing benefits offered by the application of high mineral content salt on their skin and you will most likely be met with looks of doubt and surprise! 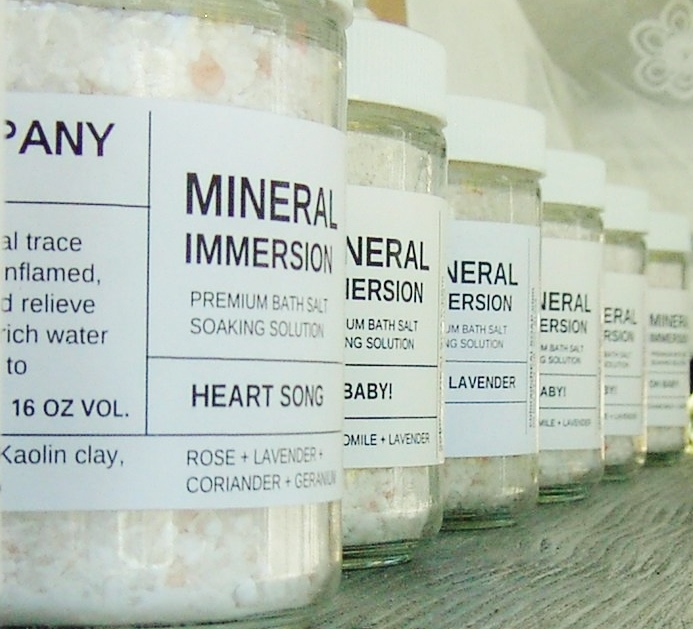 Not only is mineral rich sea salt a welcome addition to our bath water, you might be stunned to learn that it can help keep your skin stay healthy, plump and free of pathogenic bacteria and yeast, control outbreaks and acne, enhance cellular communication and increase hydration, that's right HYDRATION! Helps regulate skin oil & sebum production. Reduces clogged pores reducing the occurrence of outbreaks. Considered to be a natural moisturizer, helping balance and increase hydration of the epidermis. Salt high in magnesium is anti-inflammatory & anti-microbial which can reduce itching and helps control the bacteria and fungi which cause eczema, acne and Rosacea. By increasing circulation on the surface of the skin and improving cell regeneration, salt helps open pores, enhance blood flow, and improve the absorption of body & facial oils, moisturizers, and other treatments. Strengthens the epidermis and increases cellular communications signals which slows as we age. Improves the skins complexion by reducing redness and roughness. Through osmosis, minerals in salt helps draw moisture and nutrients to the surface of the skin, helping plump up skin cells. Improves cellular metabolism, thereby increasing the efficiency of the skin's ability to convert nutrients into energy. Earth minerals are are unique in their ability to mitigate the impact of environmental stress & pollution, sun damage and cellular aging of our skin. Of course not all salt is created equal! Only high mineral salts (sea salts) offer what we are seeking in a skin care formula so we will look at how sea salt benefits our skin. In fact, It is the minerals in the salt that act as natural moisturizing factors, they are hygroscopic which means they attract water. When salt is apply to the skin and allowed to stay there, it acts much like a pump, drawing water and nutrients to the skin's upper layers from deep inside the cells. High mineral salt have the also helps your skin by strengthening its barrier function, which support healthy skins in a variety of ways. Salt as an exfoliant: Aside from the obvious use of salt as a mechanical foliating agent what might come as a surprise is that dead skin cells start breaking down and sloughing off just in the presence of salt water. So to be effective as an exfoliant we don't even need to scrub hard, we just need to put sea salt water onto our warm, wet skin (warm water enhances this process and also increases circulation) and even better, hold it there so it can work it's magic long after you have left the bathroom. I like to use my Perfection Scrub for Faces in 2 ways. My first application of the scrub is at the end of the day and is part of my Oil Cleansing Method to remove dirt, grime, sunscreen and makeup. The butters and oils in the scrub penetrate deep into the pores and hair follicles where they gently dissolve grime so it can be wiped then rinsed away. Another way is to use the Perfection Scrub as a kind of "mask". Simply apply a small amount the scrub to WET skin and allow to air dry. The salt and minerals are bound to the skin by the inclusion of beeswax plus seed butters and oils allowing the minerals and moisture to be absorbed more efficiently over time. Put a small amount of the salt scrub in your wet palm, rub your hands together until most of the salt is dissolved, then massage it into wet skin … and ALLOW TO AIR DRY. My Perfection Scrub contains just enough beeswax to seal in moisture and reduce moisture loss leaving skin feeling so so dewy soft and supple. I have found that my skin texture has softened considerably over time by using OCM and Perfection Scrub as salt therapy. HOMEMADE SEA SALT TONER: stay tuned for a recipe for a DIY Sea Salt Toner to make at home.